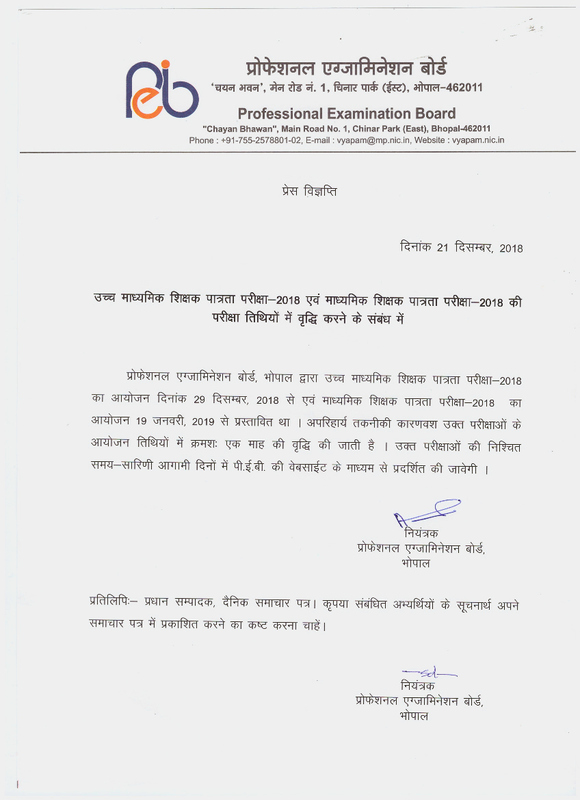 Short Information:- Madhya Pradesh Professional Examination Board has Recently Uploaded New Exam Date Notice for the High School Teacher Eligibility Test MP TET 2019. Applicants have Applied for this Exam Can Download New Date Notice Now. Secondary Board of Education, MP has invited applications for the Teacher Eligibility Test, 2018 during the month Sep-Oct/2018 itself. It is one of the important Examination for getting a job in Government Authorized School as Teacher Faculty. So, one should crack this Exam to getting a job in MP Government School. It is hereby informed that MP TET Admit Card has been notified shortly the Board of Secondary Education. Applicants need to provide their Valid credentials for downloading their Admit Card. Applicants are suggested to be on/before time on the Examination Venue and need to follow the Examination Hall Discipline and maintain Decorum of the Examination Hall. In a recent notification Secondary Board of Education, Madhya Pradesh has notified about the Exam Schedules of the High School New TET Examination for the Year 2018-2019. Applicants can check their Examination dates for the TET 2018. In order to download their MP PEB High School TET Exam Admit Card need to go to the use full important link section provided below. After providing their valid applicants will be able to download their MP PEB High School TET Exam, Admit Card. After getting the link need to click it for downloading their MP PEB High School TET Exam Admit Card. Applicants can also download their MP PEB High School TET Exam Admit Card from the official website of the MPTET.